AEON Global Health in Gainesville, GA just went through the process of rebranding their image. 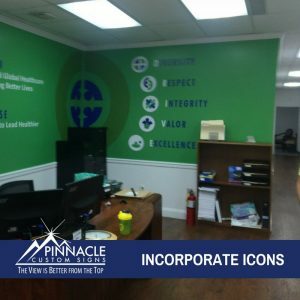 Salimah, the company official, contact Pinnacle Custom Signs to see if we could assist them in transferring their rebranding into new vinyl graphics, banners, and signage for the office. AEON Global Health is committed to helping patients lead better and healthier lives through genetic testing profiles. The information that they collect helps to connect a patient’s unique genetic makeup to their response to certain medications. This allows the patient’s physician to make informed decisions and prescribe with confidence medications that are effective to the client. They provide toxicology, pharmacogenomics, cancer genomics, women’s health profiles, and blood wellness testing at their facility. Although they know the world of DNA, they were challenged with how to facilitate their new transition because of the tight timeline. Aeon had planned on hosting an unveiling party for their new look at The Venue at Friendship Springs on Friday, August 17th. They had also scheduled a large ribbon-cutting ceremony at their offices on Monday, August 20th. Because of these events, they wanted to install the new artwork reflecting the logo over the weekend post the reveal and before the ceremony. Our team typically doesn’t work on Saturdays; however, because the only good time to do this was over the weekends, we agreed to an off hour project so that everything flowed with the timeline. 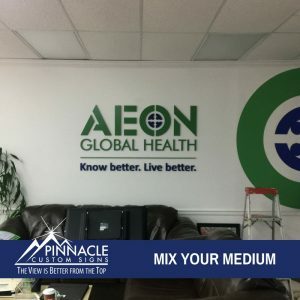 One of the key aspects that made this possible was the fact that Aeon supplied the artwork for us to create several different types of graphics for the facility. We easily produced the new business signage, and our team went on site to install the new wall graphics, floor graphics, dimensional letters, and banners. One of the great things AEON did with the artwork for this project was to maximize different aspects of vinyl to maximize their effectiveness. 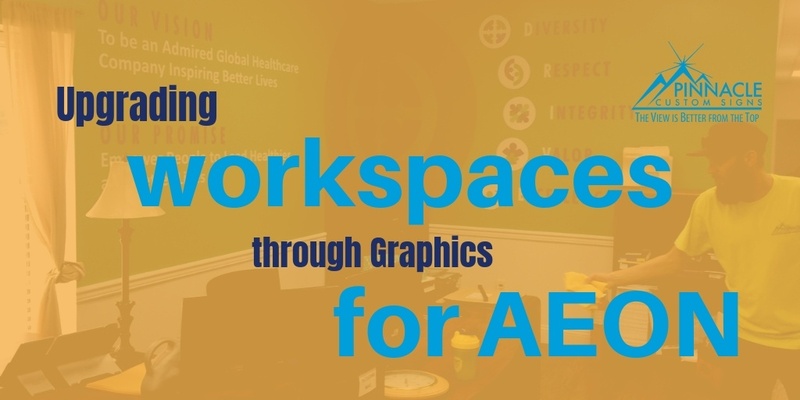 That makes this project a great case study on five different ways to diversify incorporating graphics into workspaces. Incorporating vision, mission, and other important statements in your graphics can be dynamic. Utilizing them on focal walls of the lobby, conference rooms, or employee gathering areas helps to reinforce the core ideas of the company. When using lists or statements that can be broken up with icons, the graphics become easier to read and create a better visual appeal to reinforce employee moral or convey strong points to patrons. When creating the design for vinyl, mixing different media such as dimensional letters creates a 3-D effect for items such as logos to place a higher emphasis on the most important part of the vinyl design. Images tend to evoke an emotional response by the person viewing them and can add a whole new element to vinyl graphics. Using diverse images throughout to break up or enhance wording can add a whole new level to graphics. Vinyl graphics can be used in multiple places and shouldn’t be limited to just blank wall spaces. 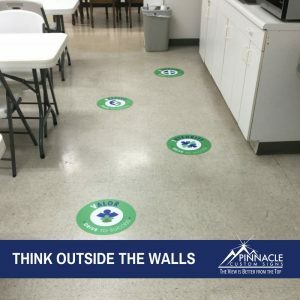 Vinyl can be incorporated on floors, ceiling, and even on things such as refrigerators and filing cabinets within your office space to provide direction or wayfinding. 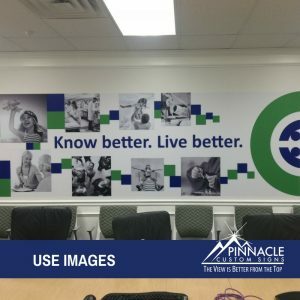 Pinnacle has experience in helping our clients with a variety of types and styles of vinyl graphics branding for their offices. From simple logos on walls to complete wall coverings with multi-layered messages, we can help your team create a complete look to convey your brand. Give us a call or send us a message to start the conversation.